After our lunch break it was time to start making our way back home in the usual convoluted manner that tends to involve more fabulous gravel roads. More tar took us through to Wimbledon and then a bit further North where we turned West onto Birch Road. 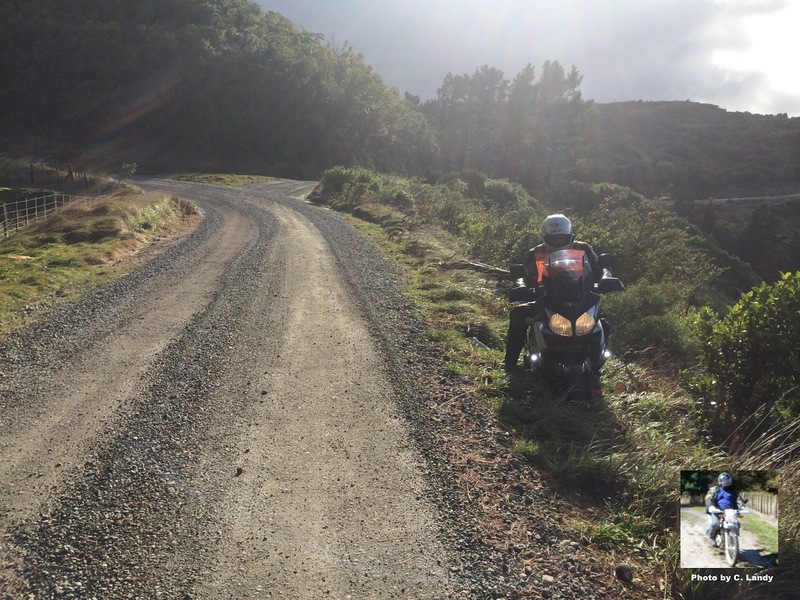 This is another cracker of a road that takes riders through a pine forest. I was expecting some muddy conditions through here as we have seen this on previous rides through here but no, not this time - I guess the Hawkes Bay didn't get nearly as much rain as the Manawatu-Wanganui region. In exposed places along Birch Road we found the wind again and got blown around a little but everyone managed to stay on the road this time. Eventually we turned off Birch Road and onto Franklin Road which took us back to Route 52 again. Somewhere along here I caught up to Ross and we had a nice little battle on some great gravel back to the main road. At the main road I decided to head home while the rest of the guys carried on to take a bit more gravel up to the limestone quarry and then down into Coonor before returning to our starting point in Pahiatua. I opted out as I was a bit cold and didn't fancy battling the wind back up on the tops again. By all accounts the guys had a good ride over the hill and got back safe and sound with no unfortunate incidents. Riding back on the tar to Dannevirke I still got blown around a fair bit and the wind was definitely on the chilly side. 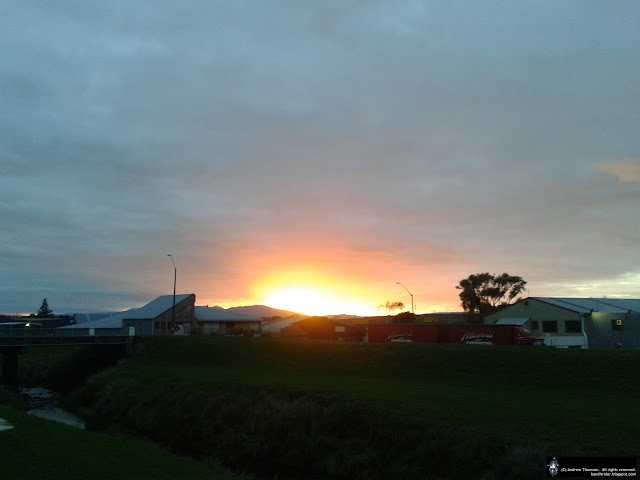 In Dannevirke I stopped long enough to put on my neck warmer and swap to my warmer gloves. 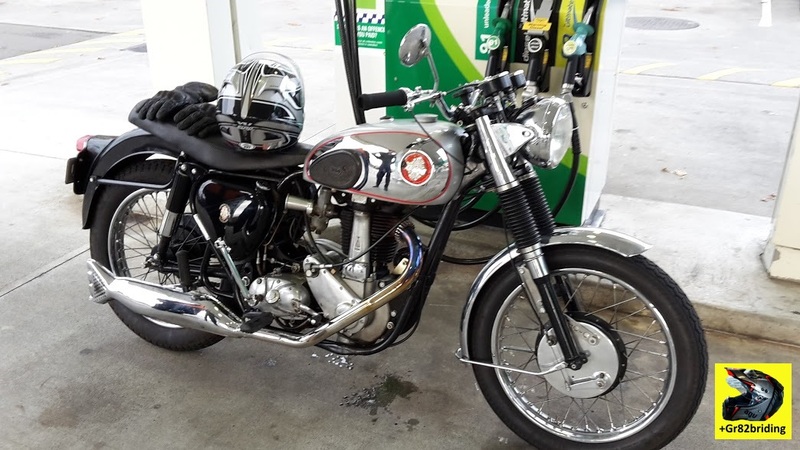 A bit warmer, I hit the road again and carried on to Woodville where it was time to top up the Vee before tackling the Saddle again. The Saddle was very busy with a lot of people heading home after the weekend and a few trucks slowing things down too. 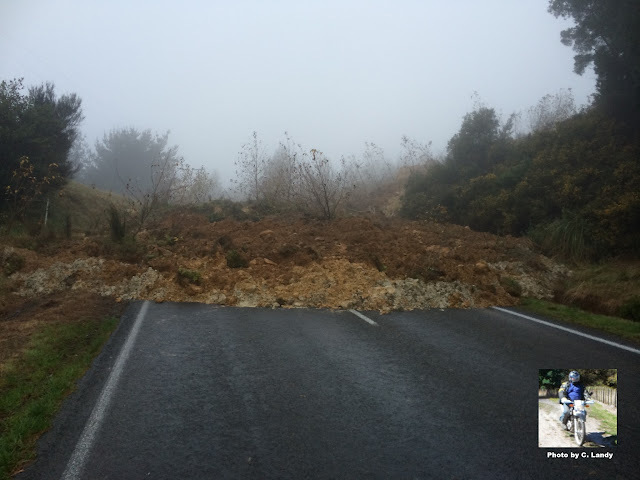 I was surprised to see how much progress the guys had made on the road works since the morning - I guess with it being the only road open from the Manawatu through to Hawkes Bay there was a bit of pressure on. I arrived home just after 4pm and after seeing to the horse (putting it away in the shed) my next priority was to get the fire going. Another fantastic day out smashing the gravel with the BRR lads! Eventually the coffees had been consumed and we were forced to gear up and go for a ride. Luckily the weather had improved with the rain stopping and what looked suspiciously like the sun making an appearance. Just after we turned off onto Pahiatua-Pongaroa Road we had to splash our way through a small puddle on the road but that would it in terms of "fording" the flood waters. As we made our way towards the Makuri Gorge there was the odd small slip to avoid but there was already a road crew out with a truck and digger starting to clear the road - the Higgins guys were earning their O/T today. Our first bit of gravel was on Pori Road and it was in really good condition so we all had a lot of fun getting to the traditional photo stop. After the quick stop we were soon underway but not for long - if you watched the video above you may have noticed the small obstacle we came up against. So, about turn then eh? 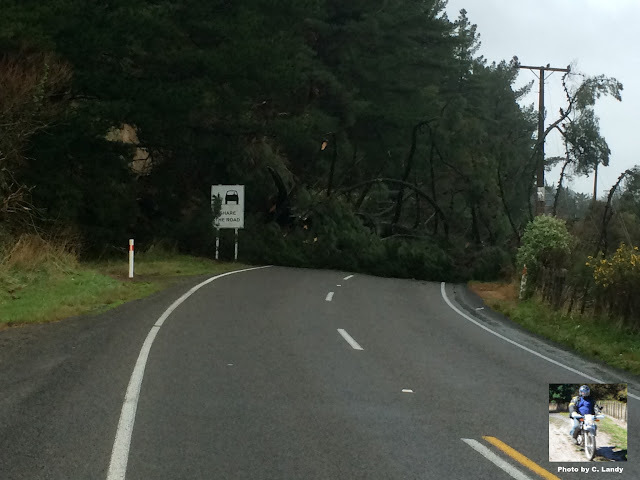 Neil decided that this little road block meant that Puketoi Road was on the cards. I wasn't too keen on that idea as on one winter ride down Puketoi Road we encountered massive bog holes and a number of bikes went down. It turns out I wasn't the only nervous one in the group so the merry band split in half with Neil's group heading for Puketoi while I led my lot back out to the main road. As you can see I pulled over at the bottom of the hill to wait for the guys who I hoped were following on behind me - I hadn't had time to check my mirrors while battling the wind! I waited and I waited, getting a little concerned and not looking forward to perhaps having to retrace my steps back up tornado alley. But with no signs of the others I eventually had to head back up into the wind. As it happened it was not quite as bad going up the hill and I was almost back at the main road when I came across the other guys just getting underway. Luckily the other guys were able to drag the bike out and they were still keen to chase me down. I managed to convince them (Colin had actually got a bit further up the road before returning to help so knew how bad things were) that it was fairly breezy further down the hill and we decided to flag Rimu Road and make for Pongaroa. From Pongaroa we took the fantastic Coast Road out to our lunch spot in Akitio. It is possible that I may have mentioned this before, but too bad - I love Coast Road! It is generally in good condition and is very fast gravel! 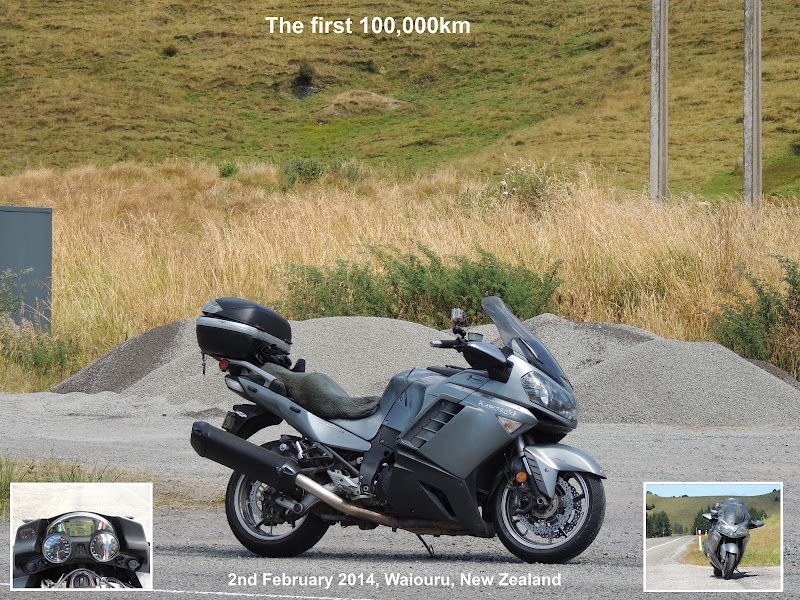 I probably used more fuel in the 30km to Akitio than I did on the previous 100km from Pahiatua! Yes, I had a ball and the Vee approved as well. To say that we got a bit of rain is a slight understatement. The entire lower North Island got hammered and in Palmy we experienced a fair bit flooding (other areas got even worse). On Saturday I had to drive through some surface flooding to get across to my parents' house in Feilding and then on the way back got turned around by two roads that were flooded and blocked off. This is a (poor) picture of the bridge over the Mangaone Stream very close to my house. This one was taken early one morning with the stream running under normal conditions - you can just see the bridge in the picture. Here it is (with the Vee parked on the same bridge) at around 8am on Sunday morning after the level had dropped overnight by approx a metre (I looked at the marks the water had made in the grass to guestimate the 1m). Anyway, with stories of closed roads, slips and flooding I simply couldn't miss the ride - it was going to be very interesting to see what sort of damage we came across. I left home about 8am and rode into town to pick up some lunch. While picking up my lunch it started to rain - a pathetic misty rain, not at all like the rain of the day before. Cruising out to Ashhurst I saw plenty of flooding with plenty of water in the paddocks and some houses and vehicles that definitely had had water through them. I also had my first bit of excitement when I had to ride through about a foot of water in one of the low sections of the road. The Manawatu Gorge was also down due to slips so our only route over to Pahiatua was the Saddle. The Saddle had actually got off lightly with few slips and just a fairly rough section of road works at the bottom of the hill on the Ashhurst side - no problems for Adventure bikes! 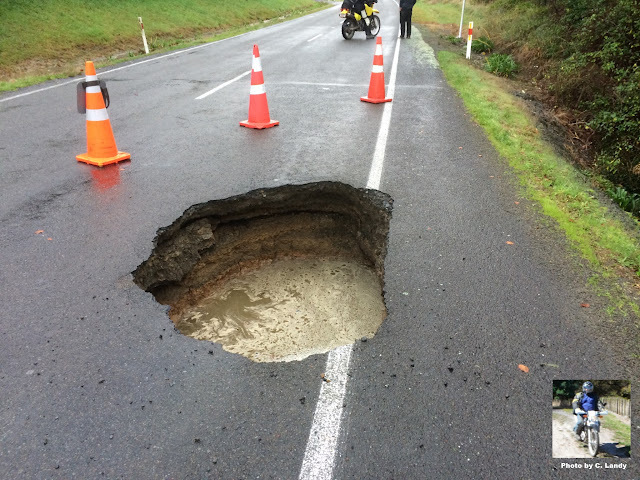 I had heard that the road from Woodville to Pahiatua had also been closed for a period due to flooding so wasn't quite sure what the ride into Pahiatua would be like. It turned out that it was fine but of course there was plenty of signs of flooding in the paddocks by the road and the river was pumping. Pulling into the garage I filled up the bike and grabbed something hot to eat and drink - it was fairly chilly out. Pretty soon the rest of the guys (the brave 8) showed up and the garage did a good trade in hot coffees while we caught up about our interesting rides in. I think that's enough excitement for Part One eh? Go hard Bruce but stay safe! We hit the road at just after half 9 with a couple of stragglers just catching us as we left. The ride up over the track was a bit of fun even though the road was a little damp in places. Never mind, we were soon on our way again as I led us into Pahiatua and then out and over to Route 52 and our next wee stop in Alfredton. By now the day was getting better and better with blue skies replacing the grey. Next up was the short squirt down 52 and then into Masterton. Heading South we settled into a SH2 licence preserving cruise that eventually took us to Featherston where some got fuel and we picked up with Neville who had been out playing on some gravel and generally in enjoying the heck out of his 1190R. Now it was time to lap the Lake - the lake being Lake Wairarapa. This is a neat ride as the rode gets pretty narrow in places and there is some nice stuff to look at along the way. No pictures of the lake though as we didn't stop because someone was hungry. Lunches inhaled, we geared up again and made our way back to Martinborough and then headed out to take more back roads to Masterton. 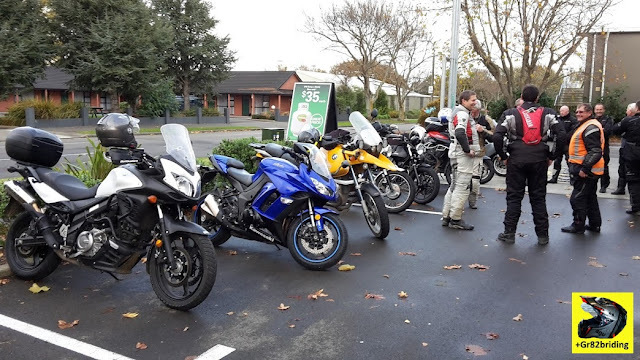 We lost a few guys at Martinborough (they had places to be) and also a Triumph rider who was low on fuel - although we found him again when we stopped in Masterton for fuel. After looking after the thirsty horses we said goodbye to a few more of the crew as they took a more direct route home while the keen ones explored Mauriceville before enjoying a squirt through Mangamire and then up over the track. A bit of fun to finish off another great "winter" ride. It looks like they needed to be changed eh?